As I said earlier in my review of the Hermès Ostrich GM Notebook Cover, I love items that bridge my interests, and while the Rhodia Clic Bloc combines my love of pens with my love of technology it hasn’t exactly won me over. The Clic Bloc is a notepad that doubles as a mouse pad and unfortunately serving double duty makes it both a bad notepad and a bad mouse pad. 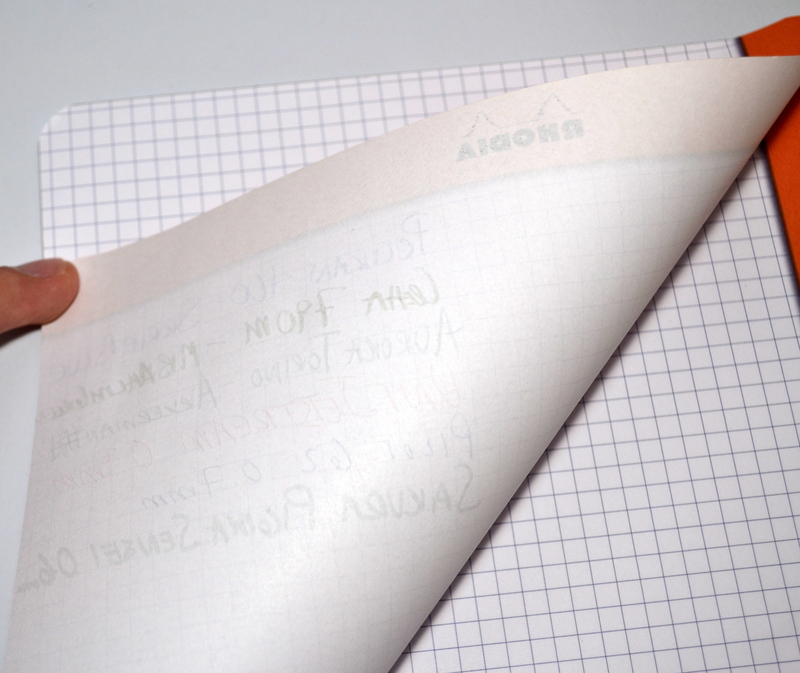 The pad measures 7.5″ x 9″, contains 30 sheets and has a nonskid backing. 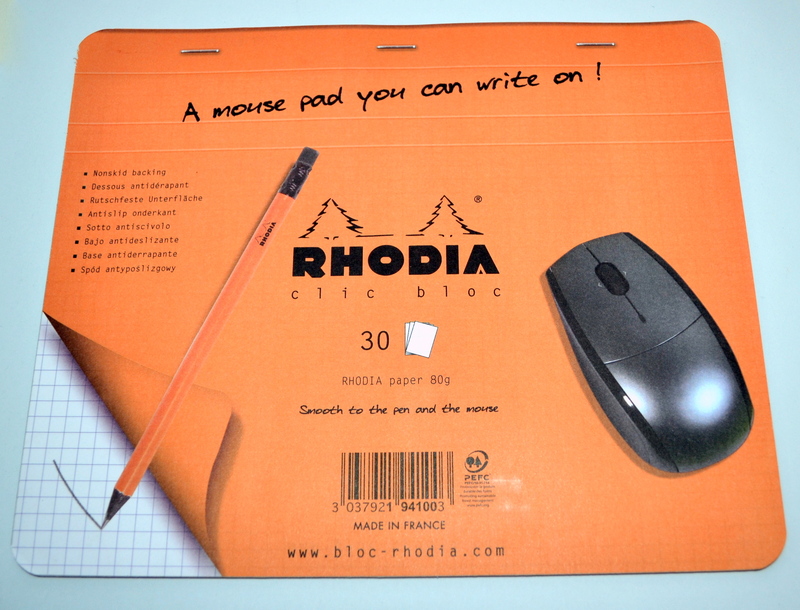 The Clic Bloc looks like a regular Rhodia notepad with an orange flip over cover, only the Clic Bloc does not have a cover, it is merely a color picture of a folded cover that even has a shadow line. It is nice that they want this product to look like the other notepads in their line but to me it is a waste of space to print a fake folded cover on every page. I also don’t like that “www. 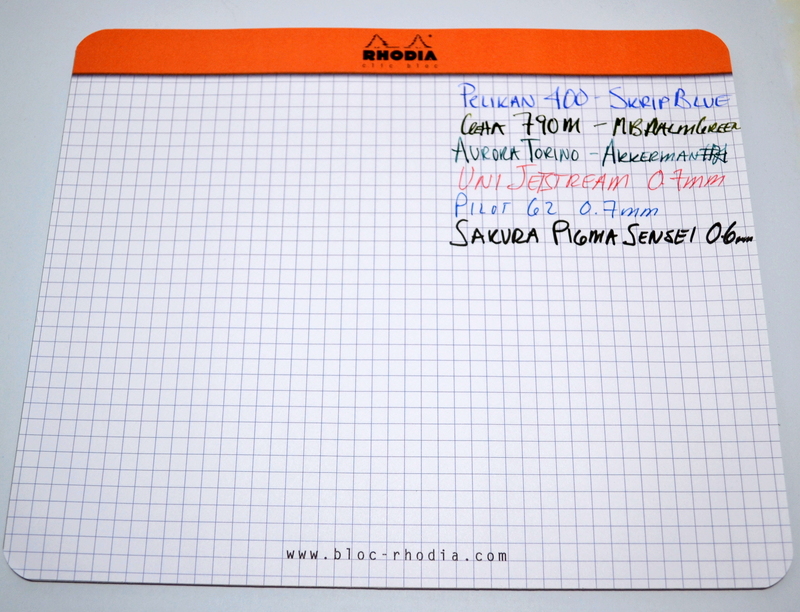 bloc-rhodia.com” is printed on the bottom. 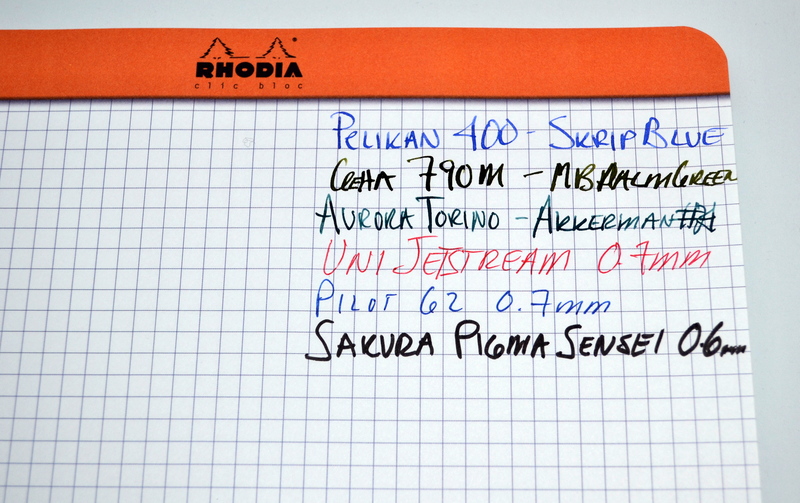 The paper is the same 80g paper that Rhodia is famous for and of course it performs superbly with fountain pen ink. No bleeding or feathering. It should also be noted that the grid is only on one side of the paper, the opposite side is completely blank. 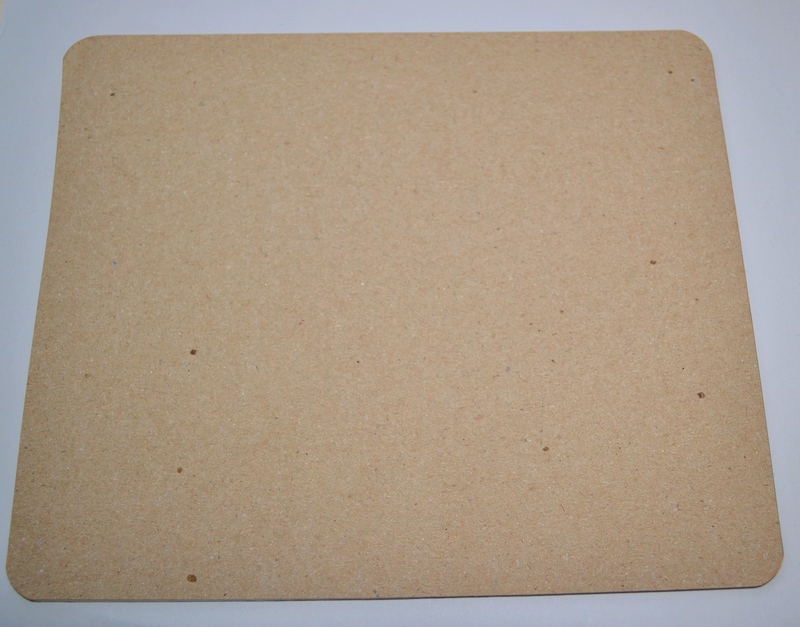 The pad is bound with glue on the bottom and left edges and tears off easily. Because its glued on the left it isn’t going to work well for left handed people as the paper is not going to stay put when you brush against the pad. As a mousepad, the nonskid backing is not as secure as a regular mousepad but it works well enough. I found no tracking issues using the pad but I found the edges of the pad to be uncomfortable to brush up against while moving the mouse around and this is ultimately what caused me to stop using it. It’s just not comfortable. I’m using a bigger than A3 stack of paper as my mouse mat, and it really doesn’t work as a piece of paper. I’ve got black marks all over it, smudge everything no matter how careful I am, and tend to reach for the post-its anyway.